Disclaimer time: I am no skincare expert. I am just a mere mortal with an above average level of enthusiasm for beauty products. Any knowledge I have has been self-obtained or absorbed from the likes of Sali Hughes' books and countless other sources. These products might not necessarily work for you and as with anything, try to trial something new first before purchasing it and/or assess what will work for you. Disclaimers aside, this is my current skincare lineup. I'm going off what I use at night more than anything else and there are some extras which might be missing. Either because I'm not satisfied with what I've tried or I'm still trialling things. 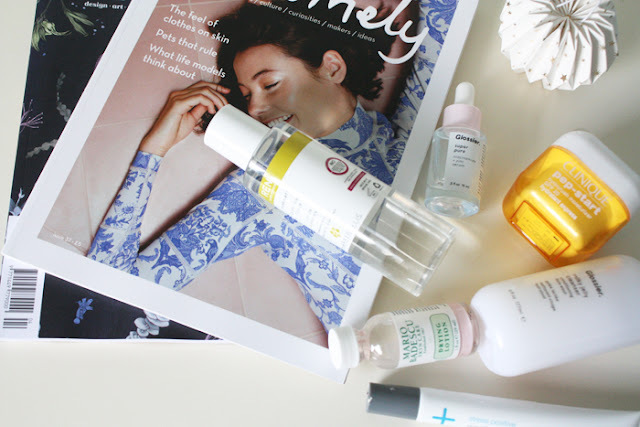 I try to keep things as simple as possible, complex routines are less likely to motivate me to maintain a skincare regime but I do try to use treatments and whatnot where necessary. For context; my skin is combination-oily, the latter more so in Summer than any other time of year. Super Pure Serum x Glossier: Before anyone asks, here is how I get my Glossier fix. Super Pure is one of Glossier's three serums, this one aimed at blemish prone skin. It contains niacinamide and zinc, designed to soothe the skin, calm down redness and sort those angry blemishes out. It feels incredibly cooling to apply, which I like and is fast absorbing. Wins all round. Stress Positive Eye Lift* x Dermalogica: The copywriting for this product is a bit perplexing so I'll just talk about what I use it for. I apply this under my eyes, pat in with my fingers and wake up with things around the eye area looking a lot more hydrated. It actually absorbs too, you aren't left with product sitting under the eyes in the morning which I love. 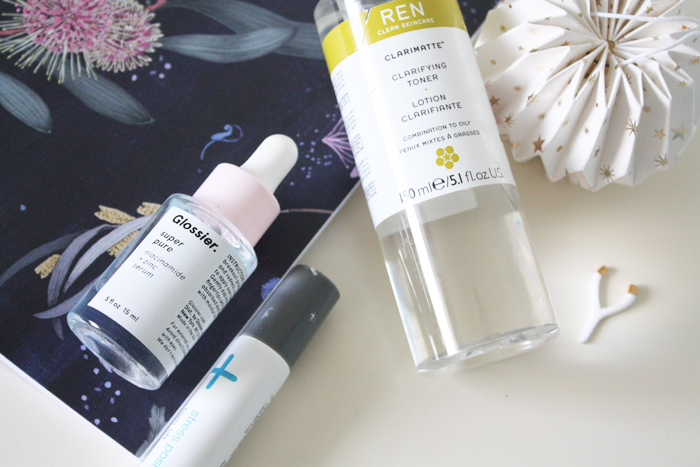 Clarifying Toning Lotion x Ren: After discovering the Pixi Glow Tonic didn't agree with my skin-boo, hiss, I went back to this toner which I'd used in the past and forgotten about. It's alcohol free and not loaded with parabens or sulfates. Yass Ren. As it's designed with combination/oily skin in mind, I feel like it's a bit gentler for an exfoliating toner. It definitely does what it says on the bottle, but it feels a bit less intensive than something like Glow Tonic. Pep Start HydroRush * x Clinique: Clinique's moisturiser has been in my routine for most of the year now and I still love it. The lightweight, bouncy texture totally sells it for me. I love that it's oil free too. Clinique recently sent me another of their moisturisers, more on that later in the week, so I'll be interested to see how they compare. 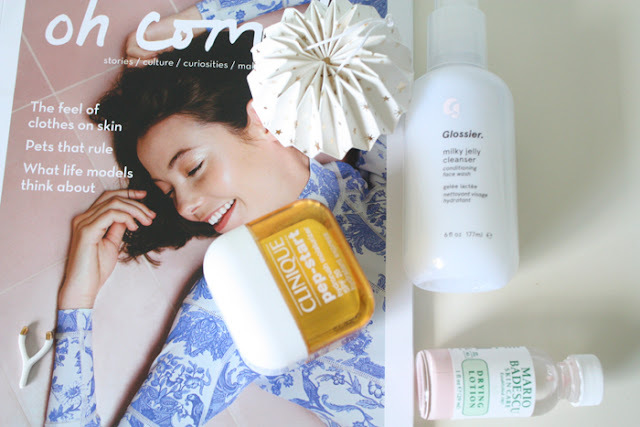 Milky Jelly Cleanser x Glossier: What's not to like with this one? Like the serum above, it's got a lovely cooling feeling. The texture as the name would suggest is somewhere between a cream and a gel. My skin loves it and it definitely leaves things looking a lot better, without feeling stripping. I can see why so many people use and rate this cleanser, Anna probably has a whole backup shelf devoted to it now. It's a beaut. Drying Lotion x Mario Badescu: My first introduction to this product was c/o Kylie Jenner on Snapchat when she talked us through her skincare routine. Yes I watched the whole thing. Anyway, it was this product she applied to a cotton bud that intrigued me. Mario Badescu are known for their facial sprays but I hear just as many people raving about this product too. The blend of calamine and salicylic acid are magic. Obviously I don't use this daily, just when I have blemishes that I want to be less visible pronto. It really works fast and if you have an emergency, planet-sized crater on your face you want to banish, this is the product. -What skincare products do you use?